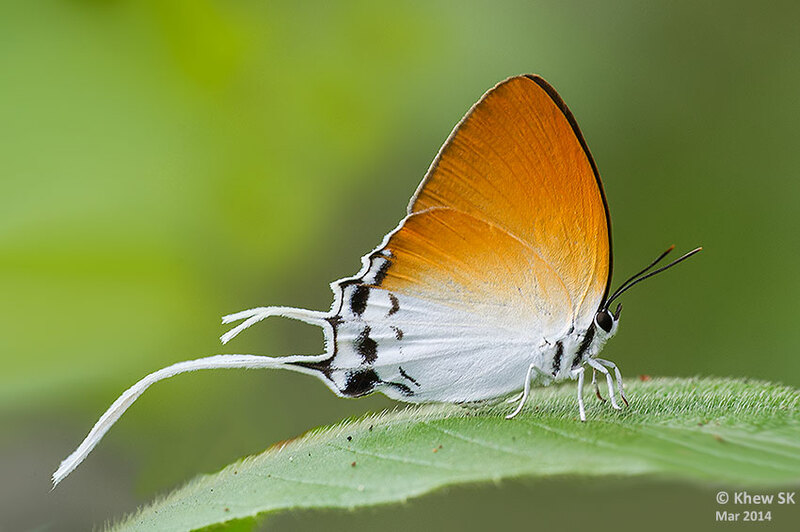 This long-tailed Lycaenid is considered a rare butterfly in Singapore and is not regularly encountered. It is one of the largest Lycaenid butterflies in Singapore and sports the longest tails amongst all the "Imperials" found here. Interestingly, this species is quite common on the offshore military island of Pulau Tekong where several individuals can be observed at their favourite locations on the island. It is a forest-dependent species and is usually encountered in the shaded forests within the nature reserves. The male Grand Imperial is a royal blue on the upperside with black apical borders. The female is dark brown above with a prominent white tornal area on the hindwing. The underside of the forewing and the costal half of the hindwing are brownish-orange and the rest of the hindwing is pure white.